12 Individually wrapped pewtertone nail cross necklaces. They make great Easter gifts or inspirational gifts for church groups. 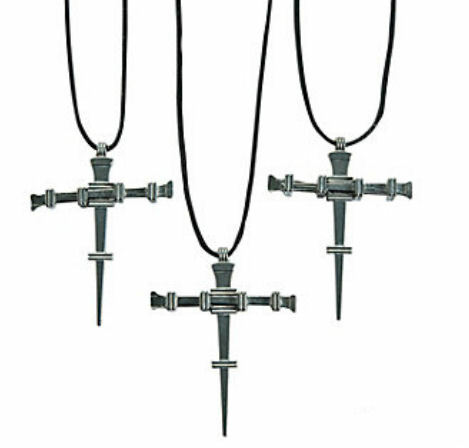 Each 2" metal cross is on an adjustable black cord and a plastic breakaway clasp (as required by the Consumer Product Safety Commission). Each cord measures about 24" around but can be cut down to smaller lengths. Symbolic: The 3 nails represent the nails used to crucify Jesus and the rings used to bind the cross together symbolize the 7 deadly sins.